Emily Thomas winds up for a pitch as first base player Lola Fisher stands at the ready in the 14-0 against Dominguez played at Thurston Middle School Friday, March 3. Breakers continue to show a spark of optimism towards the league season with a series of competitive non-league games. On Tuesday, March 7, Breakers dropped a tough 9-8 tournament contest to La Quinta/Westminster (5-1) at the Aztec’s field. Emily Thomas struck out five and Mia Pitz had three hits in the loss. 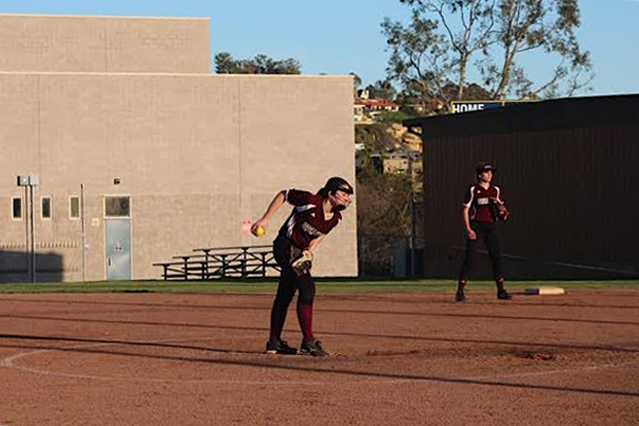 On Thursday, March 9, the Breakers rallied to crush Saddleback Valley Christian 15-5 at the Thurston Field. The following day on Friday, March 10, the Breakers and Century (6-2-1) battled to a 3-3 tie called due to darkness. Breakers will see action this past week with Westminster on March 14 and will compete in the Costa Mesa tournament on Saturday, March 18. SSCIF D7 Poll for March 13: 1 – Village Christian, 2 – Century, 3 – Bishop Conaty-Loretto, 4 – Laguna Beach, 5 – Pacific, 6 – Mountain View, 7 – Archer, 8 – Brentwood, 9 – St Mary’s Academy, 10 – Santa Ynez, Others: Desert Christian/Lancaster, Animo Leadership, Santa Rosa Academy.